RLC Quiltmakers is a small group that enjoys fellowship while sewing quilts for use in the local and world community. 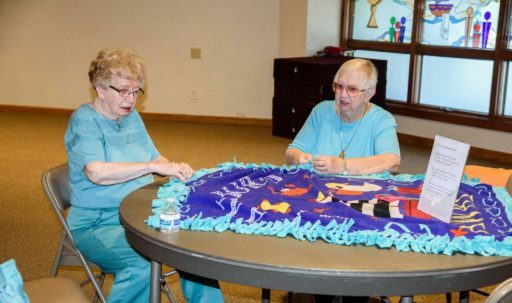 Most quilts go to Lutheran World Relief and the families of the Habitat for Humanity homes that RLC Disciples help to build right here in Indianapolis. Quiltmakers generally meets twice monthly, usually from 10am-4pm on a Saturday and 10:15am-4pm on a Thursday. Participants are encouraged to bring a lunch and join their fellow quilters for a day of fun and fellowship. Check the Weekly Events page, the Sunday bulletin, or the Bell Ringer newsletter for specific dates.